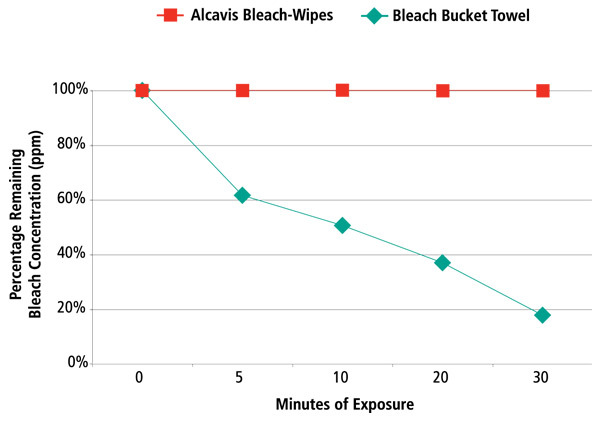 Alcavis Bleach Wipes 1:100 are available in single-towel or double-towel packages. The double-towel packages are convenient for wiping down two different surfaces, large surfaces and re-wiping surfaces that may be dirty. 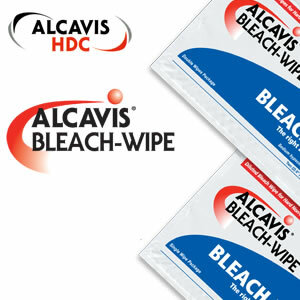 • Open the Alcavis Bleach-Wipe package. • Remove one pre moistened 8" x 10" towel, leaving the second towel in the package (for 2-towel package). • Wipe the desired surface to be disinfected. • Remove the second pre moistened 8" x 10" towel and wipe the desired surface to be disinfected (for 2-towel package). • Allow the surface to air dry and discard towels. 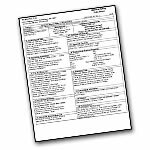 Alcavis Bleach Wipes 1:100 Material Safety Data Sheets (MSDS) include information concerning; Generic product identification, Health hazard data, Harzardous ingredients, First aid measures, Fire fighting measures, Accidental release measures, Handling and storage, Exposure controls, Chemical and physical properties, Reactivity data, Toxicological information, Disposal and Transportation information.